Patient came to her appointment as part of a standard pre-operative evaluation for removal of a uterine myoma. She had a history of stroke with residual slurred speech, making it difficult to understand her. Accordingly, I assumed I would see some carotid stenosis, but her ultrasound showed a stunning 70-99% stenosis in her right internal carotid artery and full occlusion of her left internal carotid artery. 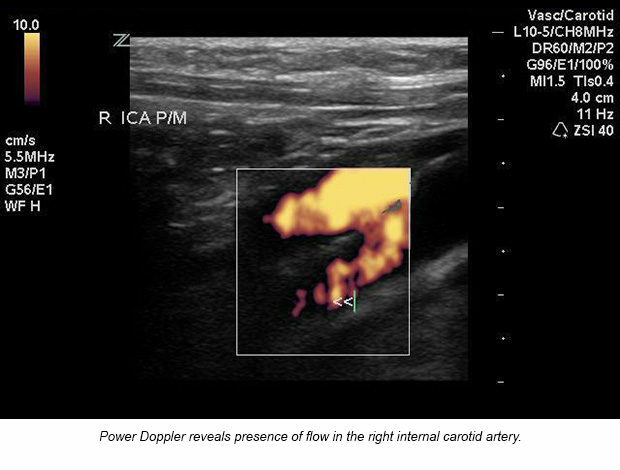 Flow in the common carotid arteries looked fine. 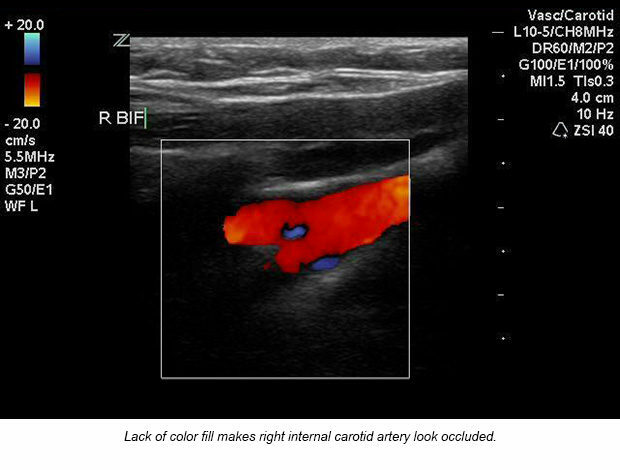 The plaque itself in the internal carotid arteries was relatively hypoechoic and not easily visualized in brightness mode, so bidirectional color flow at the proximal internal carotid arteries was surprising. 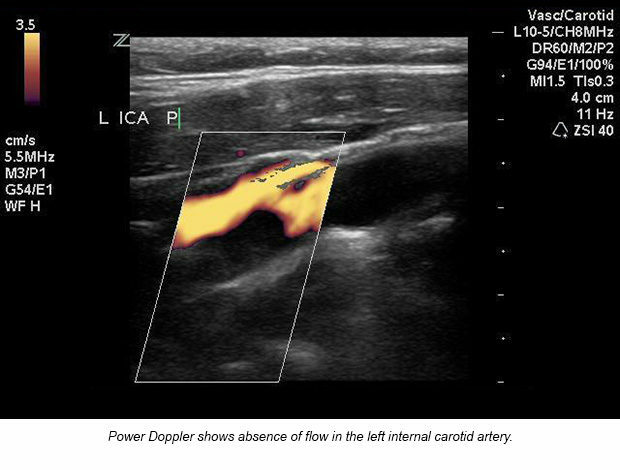 Adding power Doppler allowed me to conclude that there was presence of flow on the right, though minimal, and absolutely no flow in the left internal carotid artery. Upon completion of the exam, I called the ER and spoke with the doctor, who asked me to bring Rose to the ER. Unfortunately, due to the location of the right internal carotid artery stenosis in the bony canal and total occlusion of the left internal carotid artery, surgery was not an option for clearing out the carotid plaque, but doctors believed she could continue functioning well with collateral vasculature carrying blood to her brain. Thankfully, the patient passed her other pre-operative tests, consented to her surgery, and underwent general anesthesia with no complications. An 8-cm mass was removed from her uterus and her prognosis is good. A 49 year old Hispanic female. History of stroke two years ago with residual dysarthria and right hemiparesis. The patient came to her appointment at the Vascular Lab as part of a standard pre-operative evaluation. Utilizing power Doppler to discern occlusion from near-occlusion. 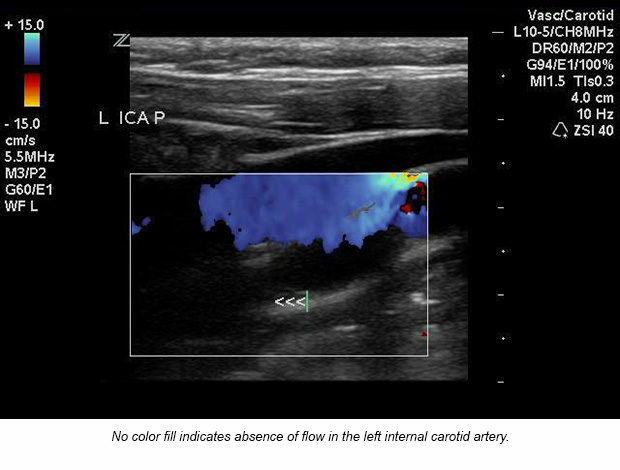 Ultrasound diagnosis: 70-99% right internal carotid artery stenosis and left internal carotid artery occlusion. Surgery cannot be performed on an occluded internal carotid artery. Correlating with the ultrasound, CT diagnosed Rose with a 99% right internal carotid artery stenosis and 100% left internal carotid artery occlusion. CT of her brain showed only an old left frontal lobe infarct, consistent with her right hemiparesis. Due to the location of the right internal carotid artery stenosis in the bony canal and full occlusion of the left internal carotid artery, the physician concluded that carotid surgery was not an option for the patient, but expressed that she is likely to continue functioning due to collateral flow around her carotid arteries.